The last greenery in Pembroke Main Street.Work has started when the peak of the aggregate delivery has been made to the Pembroke Power Station. This was taken on the day the objections to the retrospective planning objections were closed So demolition continued after the retrospective planning application for demolition was made. Which officer gave them permission to continue. In the PCC tradition retrospective Planning Permission has been applied for to Demolish the buildings, when the demolition is half completed. The JCB was withdrawn soon after we had notified PCC about what was happening behind the newly erected high fence. See 28th October 2008 post, photograph before demolition. Richard Naylor owns a listed building on Main Street, he has displayed a commentary on the lack of Planning Enforcement in the Conservation Area of the historic town of Pembroke. He has been summonsed to appear at the Magistrates Court in Haverfordwest on the 17th of May by Pembrokeshire County Council who are objecting to the display! 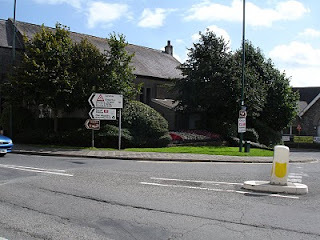 The owner of 36,Main Street has been summonsed to appear at Haverfordwest Magistrates Court on the 17th of May to answer Pembrokeshire County Councils objection to his informative display of comments posted on his shop front concerning PCC planning enforcement of Planning Conditions in the Conservation Area. His concerns are shared by most concerned residents,and most consider this to be a vexatious prosecution and a gross misuse of public funds. Despite several public meetings a group of PCC selected "localstakeholders " are meeting in secret to draw up plans for development of the South Quay Site, after Public Consultations were overwhelmingly against the Developers Plans.